On April 14th I reported that the price of Westship’s 40m Northern Lights had been reduced to $10.495 million. Now comes news from David Lacz at Bartram & Brakenhoff that the asking price is down to $9.975 million. 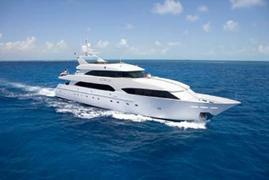 Built in 2000, she has a master suite on the main deck plus four guest cabins below and cruises at 14 knots. In January 2008 she had an interior refit of the master and two guest cabins, while in January 2009 she was fitted with a new Trak zero-speed stabiliser system.